Time: 9:00 a.m. to 5:00 p.m.
Scandinavia and other countries have folk traditions of carving spoons for home use and as gifts. The two day class is about continuing this art and craft. 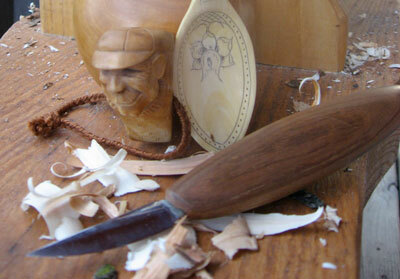 Come and discover why the satisfaction of spoon carving has taken Europe and the U.S. by storm. 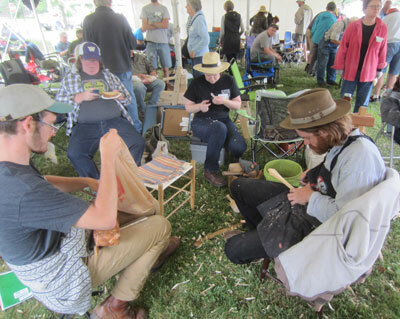 Spoon carving opens the door to a host of other woodcraft skills using axes and knives. The focus of the class is to develop the student’s confidence in the use of an axe and knife for roughing and finishing of a beautiful, durable, and usable wooden spoon. During the first morning session, students will learn carving strokes using “try” sticks and then move on to making a set of chopsticks to improve their skills. 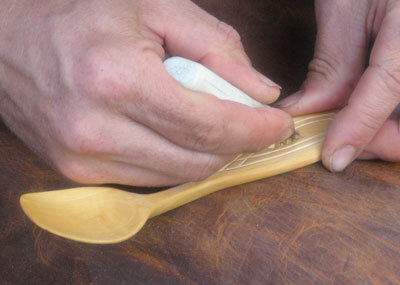 The afternoon session and following day will be devoted to carving the spoon. 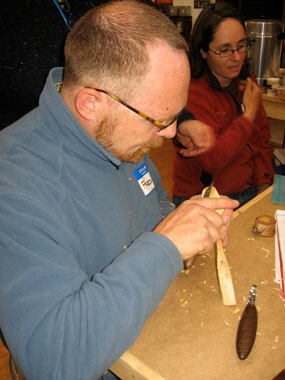 Other aspects of the class will cover sharpening, design, decorating, and finishing of your spoon. In addition, stretching and exercises, as well as posturing for fatigue-free carving will be covered to make your carving a more enjoyable experience. All covered while discussing the growing number of spoon related events you can attend to improve your skills, including the Spoon Gathering in Milan which will celebrate its 12th year this coming June. Please bring your own old and new spoons to share with the class. Fred will assist returning students with additional techniques to improve their skills. Supplies/materials: $10.00 payable to the instructor. Fred will have some tools for student use and additional spoon blanks for sale. This class is appropriate for carvers with any level of experience. On the first day we will focus on foundational knife skills and techniques that lead to a mastery of safety and efficiency. We will analyze and practice different parts of the the spoon separately, leading toward a more complete understanding of successful design. The second day will involve the study and discussion of a large collection of spoons, followed by guided carving time including an assessment of ergonomics, different tool options, as well as tool care and maintenance. A discussion and demonstration of finishes including oil, wax and non-toxic paint will also be covered. Supplies: A Supply Fee of $20 is payable to the instructor at the conclusion of the class. The instructor will provide straight and hollowing knives available for use in class. 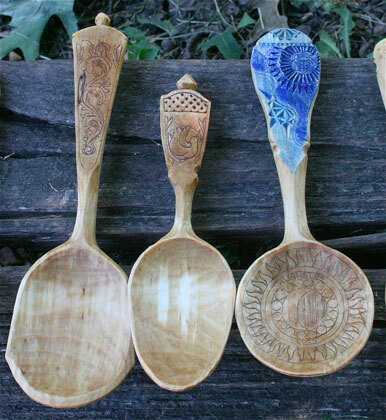 Students should feel free to bring their own spoon carving tools if they wish. Time: Friday & Saturday, 9:00 a.m. to 5:00 p.m.
Sunday, 9:00 a.m. to 3:00 p.m. In this course, open to beginning as well as experienced carvers, students will complete a figure (or two) of their choice, rendered in the Scandinavian flat-plane style. Special emphasis will be placed on carving facial features, hands, etc. After painting the figure, a final finish will be applied. All participants, even fresh beginners, ought to be able to have at least one figure completely finished and shelf-ready by the end of the course. The instructor will supply band-sawn wooden cutouts for sale and a supply of basic carving tools for sale to students who do not have their own tools. One basic carving or whittling knife is the principal tool; feel free to bring along whatever carving tools you might already own, but only one knife is really necessary. Supplies: Whatever carving tools student might already own. Instructor will have along a supply of basic tools for sale. Finishing materials (paint, wax, etc.) furnished by instructor. Bill provides carving students with carving designs for this class that highlight the historical and unique aspects of traditional Scandinavian style figure carving. Students will practice the particular knife strokes and techniques to achieve the look of the old carvers. A good carving knife is the only tool needed, but students should bring their palm gouges. 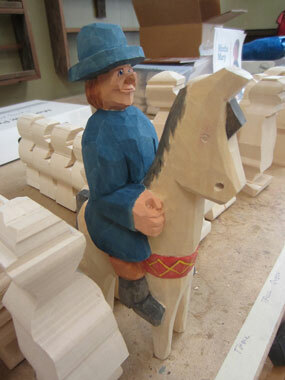 Carvers with some experience should be able to carve and paint a figure in this weekend class. Supplies: Students should bring their carving tools. Bill will provide band sawn blanks out of basswood and Pinewood Forge Knives for purchase. Finishing materials such as paint and Danish oil will be supplied by instructor. Time: 9:00 a.m. to 4:00 p.m. In this class, we will focus on what can be an illusive process of sharpening and maintaining various edge tools for woodworking. Making tools sharp is essentially a very straightforward process in theory, but the proliferation of advice and equipment can be very confusing. We will practice sharpening several different tools, using both simple and sophisticated methods. We will discuss and analyze various types of steel, as well as several different variations of sharpening equipment and technique. Students will get a hands-on opportunity to take a tool to perfect sharpness, learn how to assess when the tool needs more attention, and try some quick and convenient methods for maintenance. Supplies: A Supply Fee of $25 is payable to the instructor at the conclusion of the class. Supply List: nothing required; but students should feel free to bring a small hand tool for practice- carving knife, chisel, plane blade, cabinet scraper, pair of scissors. Pyrography is the art or technique of decorating wood by burning a design on the surface with a heated metallic point. Let’s start with the basics and work together with different techniques and discover your style! 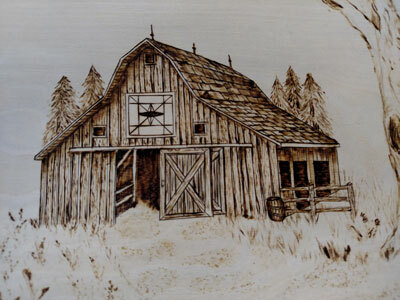 This barn project will teach you wood preparation, project layout, transferring of pattern and burning techniques using skews, shaders and other miscellaneous tips. Project can be left natural or may be finished with the use of watercolor pencils. Past students are welcome to return and work on another project. Brenda has a large number of alternative patterns to choose from or bring your own. Supplies: Supply fee $20, including materials and the rent of the woodburning unit. The instructor is an equipment supplier so units can also be purchased from Brenda on the day of the class. If students bring their own woodburning unit, the Supply Fee is $10. MVAS has a woodburning unit available for member use or for use at “Open Carving Night.” It is not necessary to be a member to join Open Carving Night. Kolrosing is the traditional Scandinavian decorative art of incising wood and backfilling with pigments. Join me for a day as I walk you through both the basics and intermediate techniques of kolrosing, including selection of tools and wood, layout and design, types of cuts, clean junctions, and finishing options. Each student will leave with a finished project and the knowledge to create more on their own. Most anything can be kolrosed, including wood spoons, wood bowls, and decorative items. Design is only limited by your imagination! Fan birds are an amazing project. They are suitable for beginning carvers, but the result is something that will amaze people that see them. 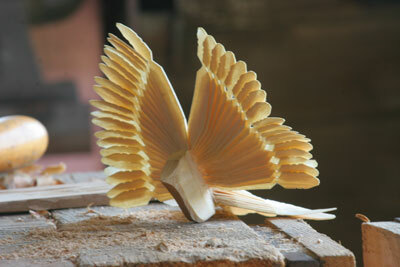 Come with me while I show you how to select and prepare wood, then carve a fan bird all from one piece of wood. We will primarily use a sloyd knife, but will also show how a shave horse and draw knife may be used for portions of the process. We will discuss how the construction of the interlock of the feathers and the pivot joint relate so that you can create different effects with the fans. We will start small and work our way up to birds with wing spans of about 6 inches. Perfect for hanging on a Christmas tree or to display throughout the year. You will have multiple opportunities to practice on blanks throughout the day to try different designs for birds. If you have a Mora 106 carving knife or similar sloyd knife, it is suggested you bring it. I will also have knives available for you to borrow and purchase. If you have a draw knife, bring it along. Supplies: A Supply Fee of $10 is paid to the instructor at the conclusion of class. Additional blanks can be purchased at $1. 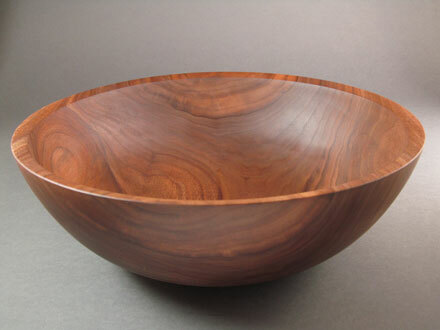 In this class, we will focus on developing the basic skills needed to turn a wooden bowl from “green” unseasoned wood. Working at the power lathes, students will learn how to properly execute bevel rubbing cuts and scraping techniques using bowl gouges. We will also cover wood selection, bowl blank preparation, bowl mounting methods and lathe safety. Each student will turn bowls they can take home. The instructor will provide all necessary tools and equipment, but students may bring their own tools if they wish. Please note that tools with carbide cutters will not be used. Students will need to provide their own face shield. For questions, please contact Steve at samco@runestone.net. Supplies: A supply fee of $45 is payable to the instructor at the conclusion of the class. All supplies and materials will be provided. MVAS has a fully operational lathe equipped with tools and sharpener available for member use. Access is by appointment. Students either need to have taken Steve’s class or have similar experience. Acanthus Carving returns to the Milan Village Arts School in 2019! Details are yet to be finalized on publication of the 2019 Class Schedule. Please contact the Milan Village Arts School for further information. Wood carving can be a solitary pursuit or it can be an activity enjoyed with a group of people. On a cold winter’s evening in Scandinavian countries it is not uncommon for friends and family to sit around the warmth of a fire and carve spoons or figurines. 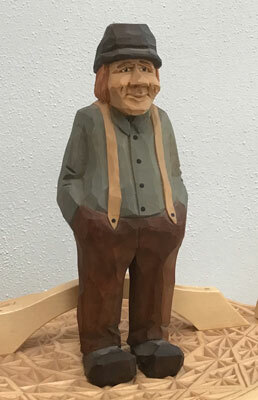 In Minnesota, wood carving is becoming increasingly popular as more and more people discover the creativity and relaxation carving brings to their lives. This growth in popularity has led to carving groups springing up across the Midwest. Open Carving Night was created to provide a wood-carving friendly environment where carvers would have the opportunity to meet, carve, socialize, and share their knowledge of carving with fellow artists. All carvers, no matter their choice of carving style, are invited to attend Open Carving Night and enjoy an evening of carving and friendship. On any given evening, a visitor to the school may observe acanthus, flat plane, figure, spoon, bowl or chip carving artists at work. Carvers of all persuasions are invited to meet at the school on the first Tuesday of each month to carve and network. Requirements: Some experience in wood carving. Students must supply their own carving tools and wood. It is not necessary to be a member of MVAS to attend. Fee: There is no fee for Open Carving Night. Time: First Tuesday of each month from 6:30 p.m. – 9:30 p.m. Please contact the school for more information or to be included on the Open Carving Night email list.